Ben threw 12-for-23 for 200 yards with one touchdown and the Pittsburgh Steelers held on for a 17-13 win against the Jacksonville Jaguars. Ahead two touchdowns in the first half, the Steelers leaned on their defense late to capture their fourth victory of the season. But he wasn’t satisfied with the performance of the offense. The Steelers travel to Arizona next week for their first meeting with the Cardinals since Super Bowl XLIII, before a critical two-game homestand against New England (Oct 30th) and Baltimore (Nov 6th). You can see video of the game highlights here. 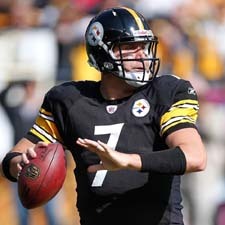 *Thank you to Mr. Wexell, at SteelCityInsider.net for the post-game quotes. Ben’s 200 passing yards today allowed him to become just the second quarterback in Steelers history to reach 24,000 yards (he entered the game needing just 122 passing yards). Terry Bradshaw is the first.